The Series V DVD release is so close now I can almost reach out and touch it. If only I had Kryten's detachable hand... 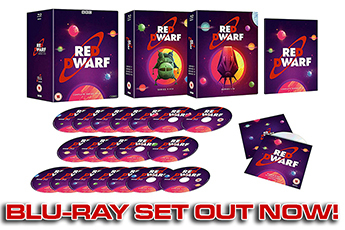 So, with a countdown that can now - if you're so inclined - be reasonably estimated in hours rather than months, reddwarf.co.uk presents the full list of deleted scenes you'll be able to watch come November 8th. Eventually we discovered the latter halves of the episodes, but still no sign of the front-ends. These were ultimately located on low-quality U-Matic tapes, run-off copies from the original edits, complete with built-in timecodes. The quality is undoubtedly lower than the regular Beta footage, about on a par with VHS. But the important thing is we got them. To be fair, in a world where deleted scenes on DVD typically come from time-coded, low-res Avid run-offs - or, for older movies, scratchy edit rushes - we're still doing pretty well. 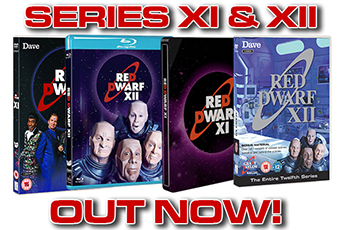 Certainly this is the largest collection so far, running over 45 minutes and containing every significant omission from each episode, as well as several 'alternate' versions of scenes which have since become familiar. 1 An excised Cat gag. 2 & 3 Two trims from the elevator scene. 4, 5, 6 & 7 Four sections taken from the scene which introduces the Holoship's crew. 8, 9 & 10 Rimmer and Nirvanah get to know each other better. 11 & 12 Rimmer discusses his plan to join the holo-crew. 13 & 14 A longer look at the mind-patching process. 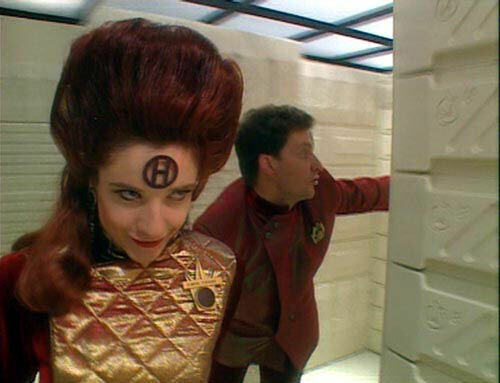 15 Holly holds up Rimmer's urgent hunt for Kryten. 16 The boys discuss Rimmer's potential replacements. 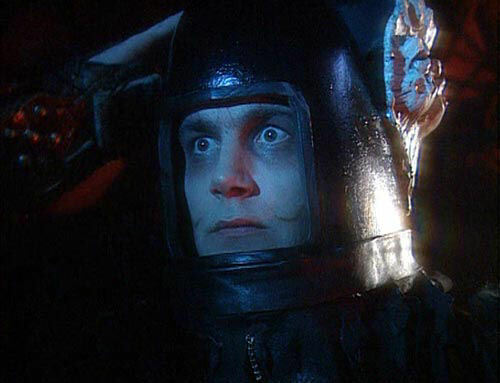 17 Rimmer explains how desperately he wanted to join the holoship. 1, 2 & 3 Three extensions to the Trojan Horse scene. 4 & 5 Rimmer and Cat come up with a plan to outwit the Inquisitor. 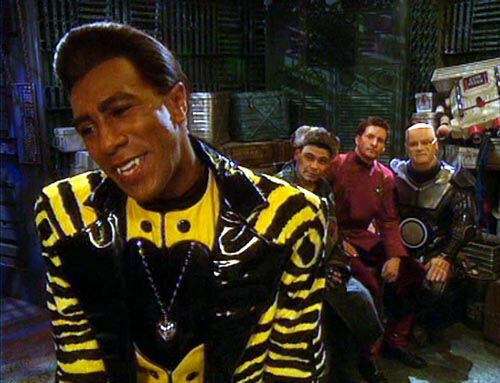 6, 7, 8, 9 & 10 Lister and Kryten face death in these trimmed moments. 11 This original ending was later re-shot with mostly identical dialogue - but without the reveal of the Inquisitor's humanoid face. 1, 2 & 3 Three time trims from the early scenes. 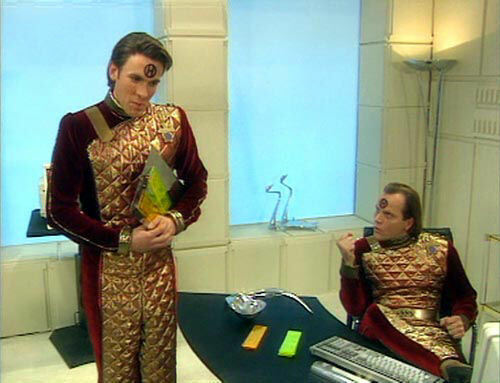 4, 5 & 6 Rimmer is confronted by 'The Master'. 7, 8, 9 & 10 Back aboard Starbug, the crew's discussions were originally much longer. 11 & 12 The Cat struggles to convey his affection for Rimmer. 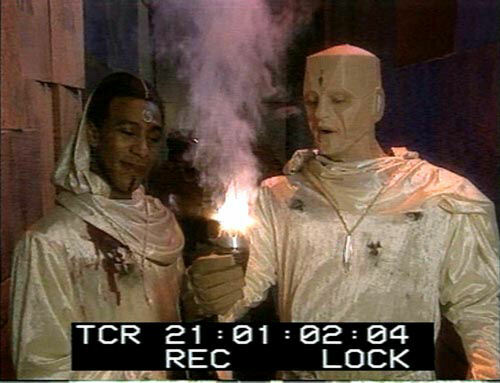 13 The final fight sequence was intended to be a great deal longer, and also revealed Rimmer's own face under the hoods of his enemies. 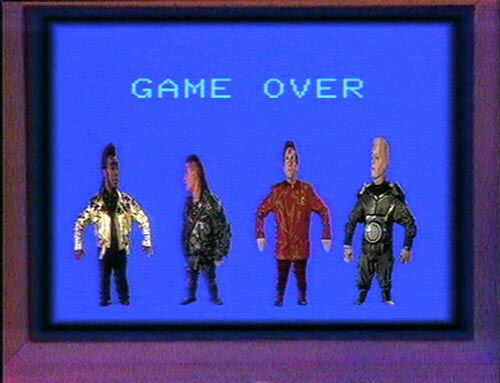 1, 2 & 3 Further examples of Rimmer's powerlessness. 4, 5, 6 & 7 More Rimmer ranting, bookended by further Lanstrom lunacy. 8 & 9 A brief cut from inside quarantine is followed by a lengthy crew scene. 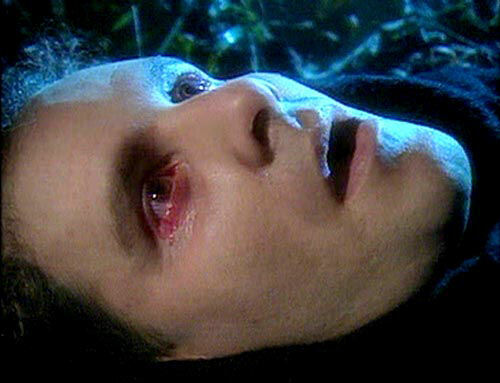 1 This original version of the opening scene was one of several later re-written and re-shot by Rob Grant and Doug Naylor. 2 & 3 Two quick lines removed for pace. 4 & 5 More time with the 'High' crew. 6 & 7 Extensions to the arrival aboard the 'Low' Dwarf. 8 Another scene that was filmed again later to improve the feel of the scene... and the bazookoid-blasting. 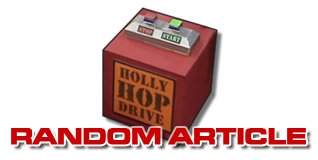 1 & 2 Kryten's gag was trimmed to avoid repeating a similar moment from Terrorform. 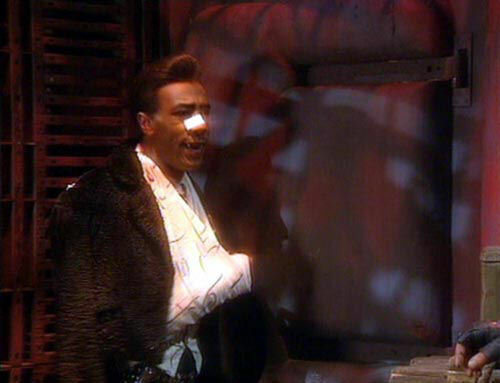 Rimmer's attempted joke-telling was perhaps the saddest loss from the episode. 3 A scene removed because of the unsuccessful '2D' effect. 4, 5 & 6 Very little was removed from this tightly-scripted episode, and these few gags remain the only other significant casualties. As ever, there are favourites. 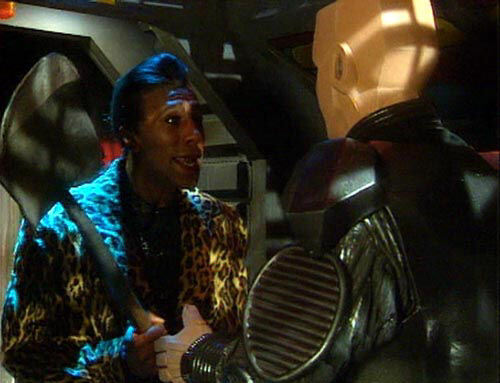 I'm especially fond of the shovel-to-the-head scenes from The Inquisitor, Rimmer's fuller first encounter with Holoship captain Platini, and Cat, Kryten and Lister's discussion on how to defeat the lunatic Rimmer in Quarantine. 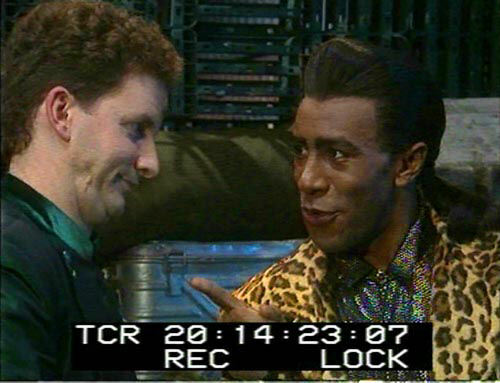 There's a lot of good stuff here... especially as Cat tries to show some meagre sign of affection for Rimmer in Terrorform. None of changes have major impact on the episodes - though the "knobbly thing the size and shape of a Mexican agave cactus" reference is now explained - and most removals are for obvious reasons. Will they affect the way you view the original shows? Maybe. Just a little.